Early 2017 Monteverde began what has become a huge expansion to their originally somewhat minimal ink lineup with a Gemstone set comprising of ten inks. They've subsequently added a Noir set and an Emotions set. Some pretty inks in the collection from what I've seen. The inks come in 30ml and 90ml individual bottles or as a full set of the 30ml. Coincidentally, the stone is also my birthstone. Whatever that means! First up, apologies if I slip and call Monteverde "Monteverdi" in some places in this review. With my background in classical composition I am conditioned to spell it after the Italian Renaissance/Baroque composer. For me this is a pretty accurate "Amethyst" colour. It's a soft lavender-like colour that isn't particularly vibrant. It has notable pink and blurple components that, on Tomoe River and some other papers, actually separate a little on the page with some parts looking pinker than other parts. This is much more apparent on a swatch, however. The ink is not particularly wet and doesn't have the strongest lubrication. 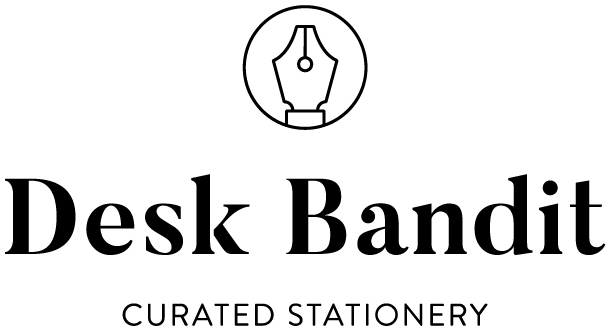 This can mean on some paper, such as Rhodia 80gsm, it can feel a little dry. It's not bad but it's not a wet lubricated ink. The ink has some very nice shading (common for less wet inks). On Tomoe River and especially Rhodia there is good contrast and a good amount of shading. The ink performs pretty well on poorer quality paper with not that much bleeding, feathering, or spread. 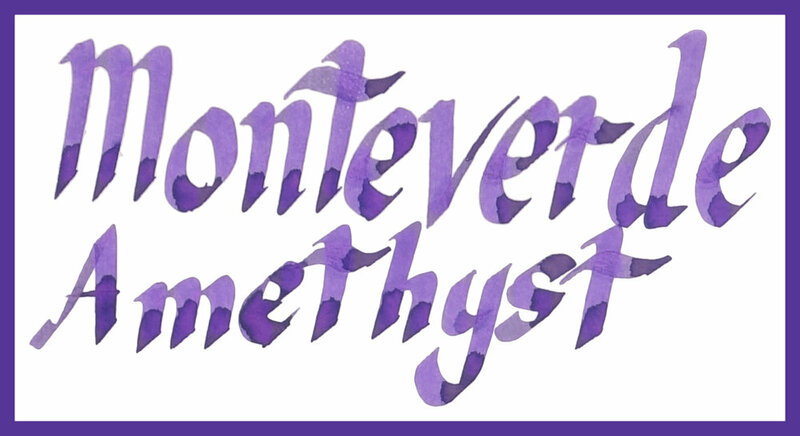 Monteverde Amethyst doesn't really have any practical sheen. On 52gsm Tomoe River there is some green sheen that peeks through where the ink pools on swatches but not really any on the written line. On Midori there the green sheen becomes a less-bright yellow-green sheen but again only on the swatch. In a very wet fat pen you might be able to coax some sheen onto a written line but it is a somewhat dry ink that dries pretty quick so it will have to be very wet. Chromatography isn't dull but isn't unusual. A slightly dirty pink moving through to a turquoise. Dry times are very good at around 20 seconds on both 80gsm Rhodia and 52gsm Tomoe River. There is no smearing on Rhodia and while I wouldn't call this paper water resistant, the pink line left behind might be readable after a water spill. In a swatch this ink's dyes from the Chromatography above separate a little and you can see parts where it's more pink than blue. This affect isn't very prominent on Rhodia but it is still there. The closest inks from my collection that I have chosen are Sailor Hankyu Sumire (a Sailor Store Exclusive ink), Organics Studio Jane Austin, Krishna Writer's Night, Sailor Fuji-Musume, Robert Oster Viola, and Waterman Tender Purple. Hankyu Sumire is too bright, blue and is flatter than Monteverde Amethyst. Organics Studio Jane Austen (apologies for incorrect spelling in the review!) is a little too dark and again flat. Krishna Writer's Night is actually nice and close but lacking a touch of saturation. 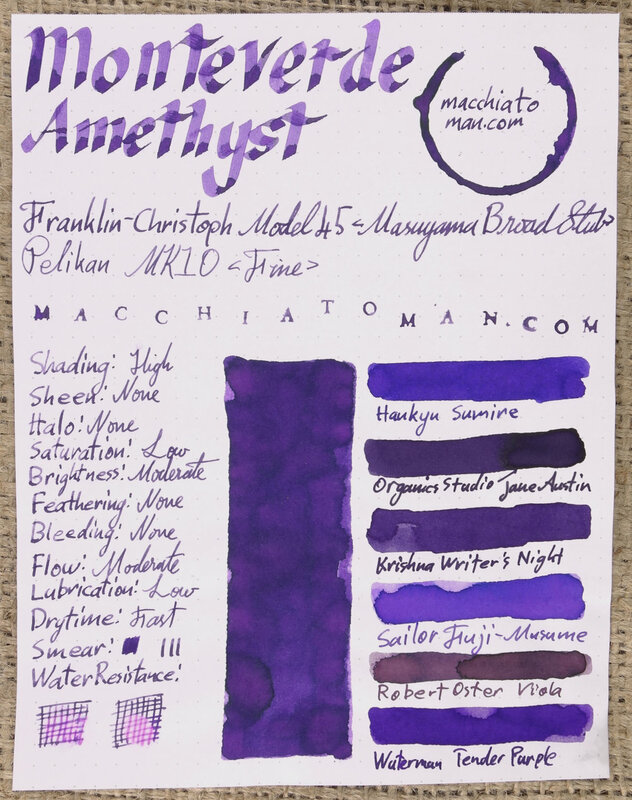 Sailor Fuji-Musume has the odd dye-separation that Monteverde Amethyst and is a similar hue but just much too light. Robert Oster Viola isn't very similar at all but I often have people ask for a comparison to it with other light purples so I thought I'd include it. Waterman Tender Purple is a similar hue but much more saturated. I feel like Organics Studio Jane Austen and Krishna Writer's Night are the closest to Monteverde Amethyst on Rhodia. Waterman Tender Purple isn't too bad if you like vibrant inks though. No smearing on 52gsm Tomoe River which is very nice. Again little water resistance but might be able to see some pink left after a water spill is dabbed away. The odd dye separation is even more prevalent on Tomoe River with pinker and bluer sections of the swatch. Hankyu Sumire isn't as different here but is still bluer and also a little softer now. Organics Studio Jane Austen has chances quite a lot on Tomoe River and is even less saturated but now quite light as well. Krishna Writer's Night has become rather blue. Sailor Fuji-Musume is now only a little lighter and the separation of dyes is also more prevalent but the pink colour is more prevent than with Monteverde Amethyst. Robert Oster Viola is also not similar at all. Waterman Tender Purple is still too vibrant but is a touch too blue now as well. It's more difficult this time but I'd pick either Sailor Fuji-Musume if you don't mind it lighter and pinker, or Waterman Tender Purple if you don't mind a bit bluer more consistently coloured. 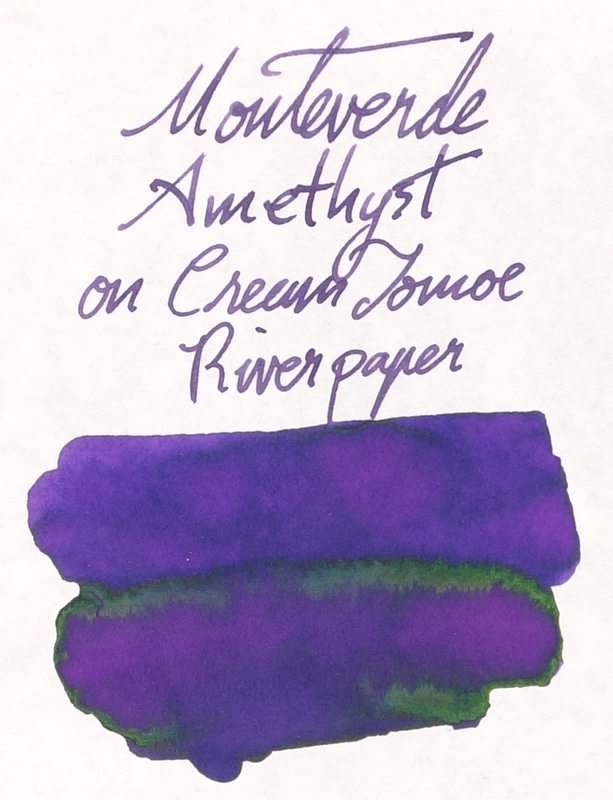 Waterman Tender Purple has a similar amount of green sheen to Monteverde Amethyst; it's there, a little, on the swatch but not the written line. Krishna Writer's Night has a lovely gold-copper sheen but also only on the swatch. Jane Austen has a matte-silver sheen (only on the swatch), and Hankyu Sumire also has a swatch-only sheen but this one is a green-silver colour. The only real comparison, sheen-wise, is Waterman Tender Purple. Monteverde inks are very affordable with the 30ml bottle varieties costing around US$8 from the US so you can't really go wrong with a few of these bottles around. They certainly have some interesting colours and some great colour variety and I think Amethyst in particular is a great representation of it's namesake. Not all stores stock the Gem Collection inks, of which Amethyst is one, as individual inks and some don't stock the 30ml, only 90. I've found that Vanness Pens have all options, Cult Pens have both sizes and La Couronne du Comte have the small bottles. 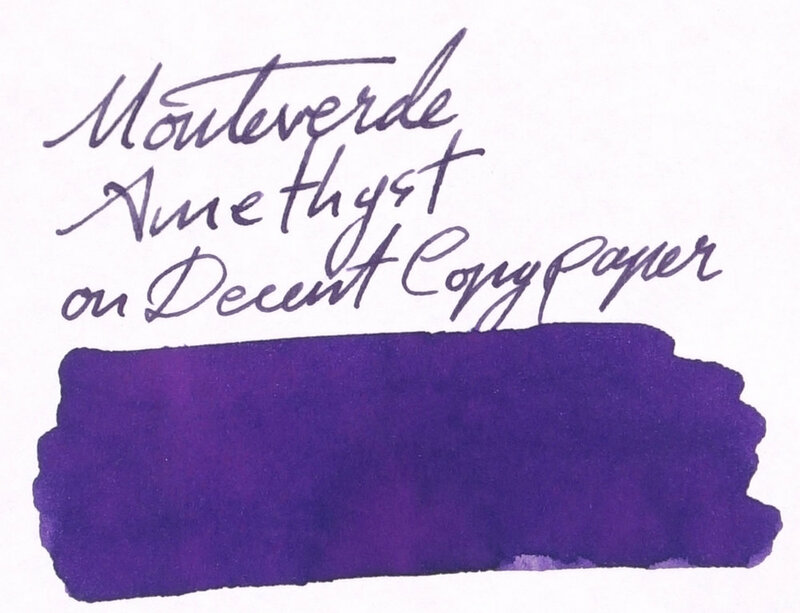 I was gifted this ink from a friend (who is not associated with Monteverde or a shop that sell Monteverde). I was not compensated for this review and everything here is my own honest opinion. There are no affiliate links.